At Glassridge, we offer Real Estate Bridge Loans. These are traditionally used by an investor who needs very short term funding to "bridge" a gap between closings or has a "cash shortfall" for a brief period. However, some of our underwriters refer to practically any loan of a term up to 12 months as a "bridge loan," including what we separately focus on as fix & flip hard money loans. Whatever you want to call it, all private lenders agree: a real estate bridge loan is short-term real estate financing. 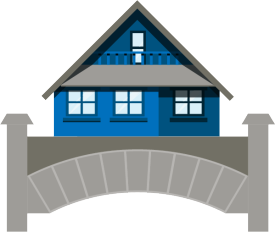 While you might use a Hard Money Bridge Loan to actually take title (or even put up earnest money) on a quick wholesale flip, or to cover closing costs and down payment on an investment you intend to quickly refinance, if your turnaround is quick enough a "bridge" loan can even be used as a quick & dirty fix and flip acquisition and/or rehab fund. Ultimately, hard money bridge loans for real estate investors are about a fast turnaround, which also tends to mean higher rates. The good news is borrowing a real estate bridge loan from a private lender like Glassridge means you can act as a cash buyer & purchase properties that the banks wouldn't touch (without putting up 100% of your own money). In fact, some of our Hard Money Bridge Loans can even cover up to 90% of a fix & flip purchase & rehab cost (in some states, for qualified borrowers). The most important factor is finding the right financing that will best match your situation. Glassridge is a broker first, in the true sense of the word, and we'll have matched lenders competing over your hot deals. See below for more info and how to get in touch.